At Windo VanGo serving Baltimore, many of our customers are concerned with how different rooms will look throughout the home if they choose different styles for each window. Because each window has different needs, of course people will choose different window treatments. But have no fear: Hunter Douglas makes it easy to coordinate your choices throughout your home. Speak with one of our trained specialists for more information. 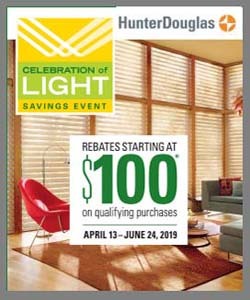 To meet your lifestyle and home décor needs, we offer the full line of Hunter Douglas products, which can give you a consistent look through your home—from the inside and the outside. 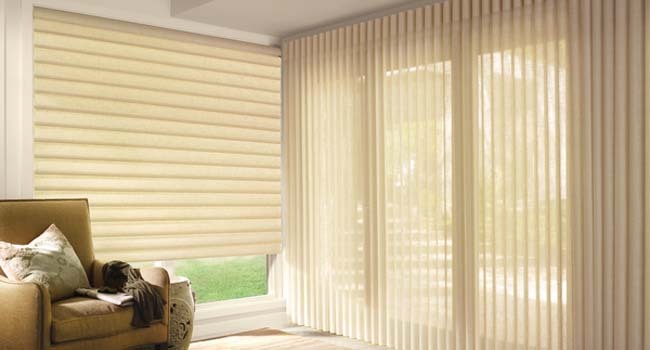 For example, with Duette® Honeycomb Shades, the backing is white to the outside; however, the front can be whatever color or fabric that fits the room’s décor. Or, in the bedroom, you might want total darkness, so selecting an opaque fabric is the perfect choice. For a bathroom, privacy combined with natural light might be top on your list, so selecting a semi-opaque fabric would work perfectly. In your living room, you might want to preserve your view while still getting great UV protection, as well as privacy, so a Duolite™ option with sheer fabric on top and semi-opaque fabric on bottom would fit the bill. Finally, if, for example, you have both a sliding door and a window in your kitchen, you could choose the Vertiglide™ option for the sliding door and a standard shade for the window. Or go with Skyline® Gliding Window Panels for your sliding door and Designer roller or screen shades for your horizontal windows in coordinating fabrics.